To read Taylor's entry in the Appletons' Cyclopedia of American Biography, click here (digitalized copy). Taylor is one of some 15,000 Americans listed in Appletons', one of the first and most definitive biographical works of its kind ever published in America (6 vol., 1887–89). James Brainerd Taylor was born in the shipbuilding town of Middle Haddam, Connecticut, on April 15, 1801. He is a maternal collateral descendant (cousin, four times removed) of famed American missionary David Brainerd (1718–1747) and a paternal collateral descendant of the famed Church of England clergyman-author Jeremy Taylor (1613–1667). The fourth of eleven children, he and his siblings were all raised in the town's Protestant Episcopal Church, Christ Church (est. 1785). Except for his near death from typhoid fever, fondness for dancing, spiritual 'awakening' yet non-converting experience, and being the recipient of some formal education, little is known about Taylor's upbringing. In his teens, Taylor worked as a clerk in the store of a hardware merchant in New York City. A host of other New Englanders, including Taylor's two older brothers, were already living and working in the city when Taylor arrived. While residing in New York, three major events happened in Taylor's life. First, he was converted to Christ through the instrumentality of John Brodhead Romeyn (1777–1825), the Dutch Reformed minister of Cedar Street Presbyterian Church (est. 1808, the spiritual parent of today's Fifth Avenue Presbyterian Church). Both Romeyn and Cedar Street Presbyterian had strong ties to both the college and seminary at Princeton. In fact, Romeyn's position as Moderator of the General Assembly of the Presbyterian Church in 1810 acted as the primary catalyst in the formation of Princeton Seminary in 1812. Immediately after Taylor's public profession of faith on September 15, 1816, he "adopted the resolution to become an uncommon Christian . . . that is, [an] eminently holy, self-denying, cross-bearing, Bible, everyday" Christian. With such a mindset, Taylor became a teacher and assistant superintendent of a Sunday school founded by his brother Jeremiah. Sunday School Number Thirty-Four of the interdenominational New York Sunday School Union Society (est. 1816) was one of America's earliest Sunday schools for African-Americans. It met at St. George's Episcopal Church where the leader of the Protestant Episcopal "low church" (evangelical) movement, James Milnor (1773–1834), was pastor. Taylor's call to the gospel ministry was the third and last major event to occur in his life while residing and working in New York. His May 24, 1819, "chance" encounter with Dr. John Scudder, as the latter was about to depart for India from a Fulton Street wharf along the East River, greatly influenced the eighteen-year-old Taylor. Scudder (1793–1855) was America's first-ever medical missionary. While Taylor received a general call to the ministry in his late teens, he did not receive a specific call to a certain field of labor. Throughout his ministerial studies, he entertained thoughts that ranged from becoming a U.S. naval chaplain to becoming an itinerant evangelist like his mentors in the ministry, Asahel Nettleton (1783–1844) and Noah C. Saxton (1798–ca. 1834), to becoming a foreign missionary to Burma or Palestine. With a desire to be fully prepared for the gospel ministry, and with the financial assistance of his wealthy older brothers Knowles and Jeremiah, James attended three academic institutions from 1820 to 1828. His preparatory studies took place at the Lawrenceville School, which was situated just fives miles southwest of Princeton on what was once the main road connecting New York and Philadelphia. The school had been founded in 1810 by Isaac Van Arsdale Brown (1784–1861), a longtime Princeton College and Princeton Seminary trustee. Outside of his studies, Taylor lived according to one of his mottos: "Up and be doing." He helped to form a Bible Society at the school and initiated a weekly prayer meeting in a village near the school, among a people who seldom or never attended church. He also started a Sunday school for African-Americans at the same village. Taylor's habit of participating in religious revivals during breaks from school began when he was a student at Lawrenceville. It is important to note that at age twenty-one, while visiting Haddam, Connecticut, during his spring break from the academy at Lawrenceville, Taylor experienced a dramatic, life-altering spiritual event. It was on April 23, 1822, that he attained, after six long years, assurance of his salvation in Christ and, simultaneously, the total consecration to the Lord that he felt was necessary to be an effective servant of God. This experience had a very strong bearing on Taylor's religious character and his whole future conduct and was joyfully remembered and referred to by Taylor months and years after its occurrence. This intensely dramatic, "second conversion" experience later attracted the attention of Charles Finney and many other nineteenth-century advocates of the various forms of the Arminian/Wesleyan holiness theology. After delivering the valedictory address at his graduation from Lawrenceville in September 1823, Taylor began his undergraduate studies at Princeton three months later. Despite attending Princeton during a time when the school was experiencing major financial difficulties and rampant student rebellion, Taylor thrived during his three year term, achieving honor roll status for at least two of his six semesters. He received divine protection from some of the ungodly students who ridiculed and threatened him because of his Christian faith and evangelistic endeavors. As an active participant in the school's Nassau Hall Bible and Tract Societies, he also interacted with and influenced some of the students and professors at Princeton Seminary. He was the prime initiator and founder of one of America's earliest and formally organized student religious societies, the Philadelphian Society of Nassau Hall (1825–1930, the spiritual parent to today's Princeton Evangelical Fellowship [1931– ]). In September 1826, Taylor was one of twenty-nine students who graduated from Princeton with a Bachelors of Arts degree. Having spent eleven years in Old School Calvinist/Presbyterian churches and academic institutions in New York and New Jersey, Taylor broke ties with this Presbyterian tradition when he chose to attend Yale Seminary. His attendance at the newly formed (1822) Congregational seminary was essentially due to pragmatic reasons: his younger brother Fitch was a student at Yale College, and it was geographically closer to his family and ministerial mentors, especially Congregational pastor and Yale College alumnus Frederick William Hotchkiss (1762–1844) of Saybrook, Connecticut. Because of his deteriorating health that began at the end of his student days at Princeton, Taylor was only able to study intermittently at Yale for two years (1827–1828). 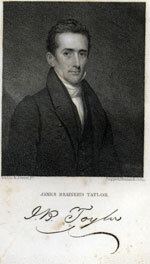 His role in the spiritual revival at Yale and the surrounding area, and his receiving of a license to preach as an evangelist from the Middlesex Consociation of the Congregational Church on October 8, 1828, in East Haddam, Connecticut, are two highlights of Taylor's brief two years as a student in New Haven. At the recommendation of his family and friends, Taylor did what his mentor Asahel Nettleton and brother Jeremiah and a host of other New Englanders did when severely ill in antebellum America—he went south to a warmer climate to regain his health. Suffering from serious symptoms like coughing up blood and severe back pain, Taylor made two trips to the South in 1828 and 1829. Though it meant suspending his studies at Yale Seminary, Taylor knew it was "the South or my grave." The first trip was to Georgia, North Carolina, South Carolina, and Virginia, from March to June 1828. On this trip the aspiring preacher relinquished the idea of ever preaching again. "The evidence was, that the trumpet had failed. The fact stares me in the face." So he wrote on May 25, 1828. Taylor's second trip to Prince Edward County, Virginia, from November 1828 to April 1829, proved to be his final journey. During this last visit, the increasingly frail, 132-pound Taylor resided in the home of the well-known Southern Presbyterian minister John Holt Rice. Rice (1777–1831) was the virtual founder and first professor at Union Theological Seminary (est. 1812/1824, moved to Richmond in 1898). Situated adjacent to the "Princeton of the South," Hampden-Sydney College (est. 1776), Union is the third oldest Presbyterian seminary in the United States. Both Taylor's eldest brother Knowles and Knowles's father-in-law were main benefactors of the seminary. Knowles Taylor and J. H. Rice had formed a close friendship during Rice's numerous fundraising trips to the North. It was in the home of John Holt Rice, with Rice's wife Anne and Taylor's younger brother Fitch by his bedside, that James Brainerd Taylor died of pulmonary tuberculosis on Sunday, March 29, 1829. Taylor died just seventeen days shy of his twenty-eighth birthday. With the bottom of his epitaph reading, "Reader, his epitaph is what he would have yours to be, A sinner saved by grace," the remains of J. B. Taylor are today at the Hampden-Sydney College Church Cemetery. At the request of surviving brothers Knowles, Jeremiah, and Fitch Taylor, Rice began compiling a memoir on James. Because J. H. Rice died while working on the project, Benjamin Holt Rice completed the memoir. B. H. Rice (1792–1856) was J. H. Rice's younger brother, a Presbyterian minister, and brother-in-law to Princeton Seminary's Archibald Alexander. At the time of its completion, B. H. Rice was the pastor of the First Presbyterian Church of Princeton. With the first edition appearing in 1833, the memoir had six to eight editions published, including one in London. In many of the editions the following dedication appeared: "To the Students of Theology in the Seminaries of the United States, particularly, and to the Christian Church generally, this little work is affectionately inscribed, by the compilers." By far, the most popular edition of the memoir was the second edition published by the American Tract Society. The Society reprinted the memoir up until the 1870s. Because of the memoir's popularity, and because of some additional manuscripts that were found since the printing of the memoir, Fitch W. Taylor's A New Tribute to the Memory of James Brainerd Taylor was published in 1838. In a similar way that the compiler Jonathan Edwards used the life of missionary David Brainerd in his 1749 memoir on him, so the compilers of Taylor's memoirs had the primary goal of using James's life as a model for what true evangelical Protestant spirituality should look like, and especially what it should look like for theological students, ministers, and ministers-in-training. Among a multitude of Christians the memoirs influenced in America and abroad, the legendary Scottish missionary-explorer to Africa, David Livingstone (1813–1873), is probably one of the more notable names.